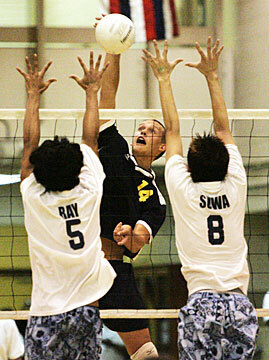 Punahou's Spencer McLachlin hit past Waiakea's Ian Ray, left, and Jasen Suwa at McKinley High yesterday. THEY WERE ABLE to hang early, but Waiakea quickly found out why No. 1 Punahou is a favorite to repeat as state champions. The Buffanblu easily handled the Warriors, 25-13, 25-14 in the quarterfinals of the 2005 Nissan State Boys Division I Volleyball Championship last night. Senior Kealii Frank controlled the tempo at McKinley's Student Council Gymnasium, slamming down seven kills in nine swings. The 6-foot-6 middle also added a match-high three blocks in the win. "We plain don't have enough offensive firepower to match up," Waiakea coach Ecko Osorio said. "Everybody did what was expected of them, but it wasn't enough." Punahou (17-0) advances into the semifinals and plays Kahuku today at 6:30 p.m. The Warriors (15-3) take on Molokai in consolation play. It will be an all-Oahu party in the semifinals, as Iolani, Kalaheo and Kahuku all advanced yesterday. Buffanblu outside hitter Will Ehrman added six kills. Branden Medeiros and Jason Suwa led the Warriors with six kills apiece. With both teams struggling with their offense early on, the Warriors kept the match close, trailing 11-8 following a Punahou hitting error. "We were a little bit on our heels passing the ball. We were a little tight," Punahou coach Peter Balding said. "That put a little bit more pressure on the hitters. The hitters have to try to hit a more perfect shot." But the Buffanblu got some separation, building a six-point lead with the help of two kills by Frank in the middle. Branden Medeiros brought the Warriors within three with two quick kills. But from there, Spencer McLachlin took over. The 6-7 junior, usually a top offensive weapon, had a relatively quiet night at the net, collecting one of his two kills to increase the Punahou lead to 17-13. McLachlin then went back to serve, reeling off five points as the Buffanblu closed out the game on a 9-0 run. "It's funny because in warm-ups, I didn't make one serve, so I didn't expect to do that well," said McLachlin, who picked up an ace and forced bad passing during the stretch with his jump serve. "But if my hitting isn't doing very well, I try to contribute in other ways." Game 2 seemed like a repeat of the first early on, with the Warriors keeping within three points of the Buffanblu. But with the Waiakea trailing 11-8, Punahou went on another run, outscoring the Warriors 13-6 as they slowly pulled away. "We were able to tool them sometimes, but otherwise, we couldn't get anything," Suwa said. The Buffanblu out-hit the Warriors, .302 to .000 in the match. "It would have been better if we could have scouted them," Osorio added. "We knew nothing of what they like to do, so we had to learn as we go." Colan Ishii ended the night with a service ace down the line. "We did what we had to do," Balding said. "At times it wasn't real pretty. They created some problems for us, but we kind of took care of business." Though the Buffanblu won the match by the largest margin so far in the tournament, Balding said he expects the Warriors to be real competitors in years to come. "Those guys are probably the future," Balding said. "They do a lot of good things...They're going to be playing for the state championship real soon. I'd watch out for them." Despite a large contingent of fans cheering them on, the Warriors couldn't get their offense flowing, falling to the Raiders 25-21, 25-21. Iolani (16-2) plays No. 2 seed Kalaheo in the semifinals today at 8 p.m., while Kamehameha-Hawaii faces Pearl City in consolation play. After nearly being eliminated the day before, the Raiders got another big performance by senior Kawika Shoji, who led the team with seven kills. Jacob Naki and Isaac DeGuzman each registered six kills. Elias David had a field day, racking up 16 kills as the Mustangs easily eliminated the Chargers in the second quarterfinal yesterday 25-14, 25-17 . Middle Chase Moses recorded seven kills, while Tyler Caswell added four blocks in the win. The Chargers (11-6) were led by Gary Panui with three kills. Kalaheo (15-1) advances into the semifinals and plays Iolani. Charles Bell and Okesene Ale Jr. combined to slam down 18 kills as the Red Raiders knocked off the fourth-seeded Farmers 25-23, 25-18 . Kahuku (12-6) plays Punahou in the first semifinal today. Jarren Kaio added four kills and five blocks in the win. Justin Neuhart led the Farmers with six kills, while Ives Rapanot added three. The Farmers appeared out of sync in the first game, losing several points on bad connections between the setters and attackers. Though they trailed by as many as five points in the middle of the game, the Farmers recovered to tie the Red Raiders at 21-21. But Kahuku closed it out with a solo block and a kill by Kaio, followed by a Molokai hitting error.